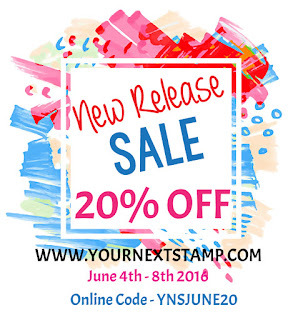 Who's ready to see the Your Next Stamp New Release? Its time for the June Release Blog Hop and you are going to love this release! My first project using the new set Fishy Fun and the coordinating dies. I created a background with a stencil and some Distress inks on a piece of watercolor paper and then I die cut the panel using the Stitched Rectangle Dies. I adhered the panel to a top folding White card base and then I stamped the Fish images and colored them in with Copics. I adhered them to the panel using foam adhesive. I stamped the sentiment onto a banner cut from the new Cool Tags 3 die set. For a pop of Sprakle I added some of the Cosmic Crush Sparkly gumdrops. My second card using the fun new Fairy Tale Homes and coordinating die set. I created a scene with some Masking and Distress Inks.. Then I colored the tea pot in with Copics. I die cut the panel and stamped the sentiment from the same set. I added the panel to a top folding White card base with some Foam adhesive. Then I stamped the images and colored them in with Copics and die cut them with the coordinating dies. I added them to the panel with foam adhesive as well. I die cut a few clouds from the Puffy Cloud die set as well. Are you ready to Hop along with us? Be sure to leave comments along the way for a chance to win a $25 GC to the YNS store. How adorable are those little fish, I just love them to pieces . I really love nautical themed cards and this fish set would make so many adorable cards .. I like the masking of the little girl and the house stinking cute . Great job ! I love the teapot house! Too cute! Love both cards. So punny and cute. Great stamping and coloring. 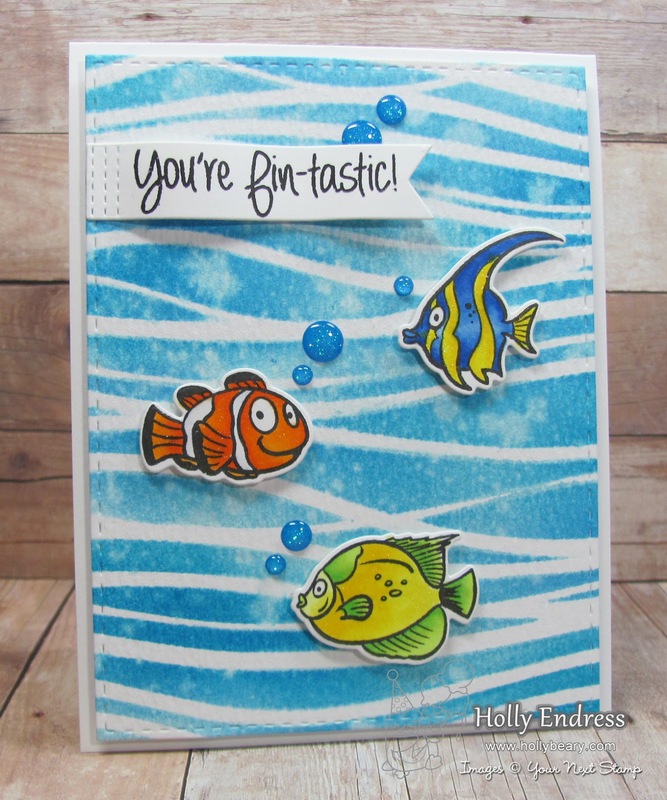 What a great stencil - it creates the perfect background for those cute fish. Love the stenciling with cute fishes, Fin-Tastic!!! And the teapot house with fun sentiment is totally awesome with a cute girl! The tea card is so cute. My daughter would definitely love this set. Beautifully colored cards! Love the Teapot house - adorable! Awww! I really like the fairy and her teapot house! What a sweet set! great new release love it!!! Your fish card is beautiful. Are dies available for the fish? Thanks for sharing. Love these cards. The fish stamp is great. My granddaughters would love the fairy tale homes set. Such fun and colorful designs! Great cards, Holly! 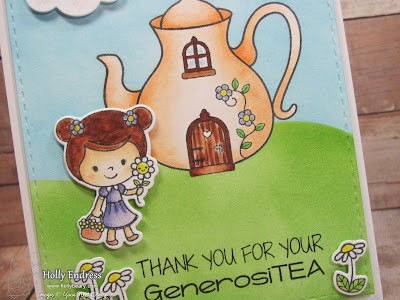 I love the background on your fish card and your "tea" card is adorable! and the fish are colored so vibrantly. the little girl and her teapot are cute. Squee Holly, for two really cute cards. I just love love your fish card with that background! These fish are so bright and colorful, Holly! I love this fun design! I love the undersea card. Great background! Both cards are just adorable. I just love the new fish set. So sweet. Oh just love the festive and fun ocean scene. As the teapot house is also darling! Cute cards and fabulous coloring. Delightful cards with great details! Love the waves and the fish, and the teapot house is adorable! So much cuteness! I love your cards so adorable! Oh, two great cards with scenes. I love them both. I need to find that water stencil. Thanks for sharing. The teapot house is soooo cute!!! oh my goodness, the teapot house is just adorable! I really like the way the fish are on the watery background. These are fairy fin-tastic cards. your cards are so cute..
Hi Holly ~ Your cards are awesome. 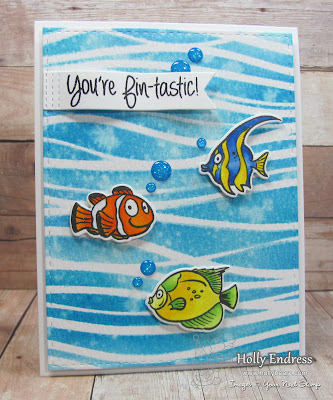 I love Distress Inks and how you used them to create the awesome background for your fun Fishy Fun card. Your 2nd card, using Fairy Tale Homes, is absolutely precious! Such a sweet, sweet card. Thanks for sharing. The fish set is just so fun and cute. You all seem to be having fun with it! The Fairy Tale homes set is just precious. I love the fish! Of course they remind me of Finding Nemo. The water background is really cool too! Fabulous colors and love the water background for the fish. I like how you created the scenes/backgrounds on your cards. Wonderful! Such beautiful cards. Love the images and color combination. Beautiful cards. Just love the fishy stamp set. Great for creating little scenes. LOVE the fishy stamps and the card is beautiful. The tea pot is so cute! YEY!